One cannot fully appreciate Glenn Beck, the performer, without actually seeing him, but it’s worth taking the time to review one entire show, from 5/17, to understand him a little better. During this show, he addressed for the first time since the Review began “bloggers” who he accuse “never address the facts of this program; they just call names.” Apparently, Beck has not yet discovered The Glenn Beck Review. This effort was undertaken precisely because he and his claims are being taken very seriously, analyzed and rebutted. In previous posts, it was proven that he lies, that Beck lies about being honest, that he is thus a hypocrite and that he does not seem to be very smart. As clever and talented as Glenn Beck is as a salesman, it appears–based upon various observations–that he is not a deep thinker, not a pundit. He seems to be a charlatan, but you decide after reading "The Glenn Beck Experience." The Review has not and never will call him anything that is not first ascertained from the determined facts. Fear mongering or clarion call? Are we past the worst? Will America look that same 5 years from now? Naturally, Beck showed a little clip of President Obama stating that the worst of the recession–that we’re either still in or coming out of depending upon whom you consult–is over. Regarding question 2, he never really answered with any factual information. He certainly did not point to any jobs report, because it’s clear that the economy is still shedding jobs in some areas and sectors while other regions and sectors are hiring. Question 3 is the most interesting one. When has America ever looked the same five years after any time in its history? The changes may have been slow and minor in the years of the founding of this country, but European Americans have been building, clearing land and new roads from before the American “Revolution.” In other words, this question does not make any sense; it’s unintelligible. Is this the question of a pundit or a charlatan? America is way off course. What does this statement say? He thinks he may have "proven"…. Translation: he has not proven that. The Review has proven Beck is a frequent liar, not maybe. There is certainty in proofs, not maybe not baseless accusations. Beck points mostly at the financial crisis in Europe over the debt crises in Greece, Portugal and Italy as a sign of things to come here and points out that some hedge funds are betting that the $1 trillion bail out of Greece will not work. Is this fear mongering or a clarion call for people to start taking steps to protect themselves? One answer came at the commercial break. The first ad to come on at that break was for buying gold, the safest investment in uncertain times. The more Beck can convince his viewers that the feces is about to hit the fan, the more gold he will sell. Admire or disdain Glenn Beck, you have to admire his ability to sell. Consumer confidence builds upon a continuous loop of buying, then exhausting stocks of goods, which in turn requires manufacturers to increase production of those goods. Thus, employment is increased, leading to more demand for goods and services. Beck’s pessimism works to break that cycle in a self-fulfilling prophesy of economic collapse. 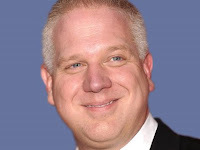 Like Rush Limbaugh, Beck’s role model, Beck wants this Administration to fail. Beck likes to remind his viewers how patriotic he is…while doing what he can to help turn the economy downward. In the previous post, it was Alex Jones who called Beck a Benedict Arnold. The Review sees that as slightly hyperbolic. To be sure, Beck never used that phrase, but he makes it very clear in the next segment and in many of his episodes that he thinks the wall between church and state needs to be torn down. He showed a clip of his commencement speech last weekend at Liberty University calling on Americans to return to God. Liberty University was founded by Jerry Falwell. Liberty University choose a college drop-out to address their graduating class. What’s the expression? Only in America. Beck has been droning on for the last few weeks about an alleged crime syndicate of people who have worked together on building the foundation of the Chicago Climate Exchange that will be the heart of the market in a cap-and-trade regime. He addressed the role of Franklin Raines, ousted, former head of Fannie Mae, in getting Fannie Mae to purchase the software that is used to track the trading of greenhouse gas credits. One congressman was interviewed to get his update on attempts to audit the books of Fannie Mae. The Review has covered this alleged syndicate, but so far Beck still has not stated or even hinted at what laws the Crime, Inc. conspirators supposedly broke. Beck will return to Crime, Inc. in the coming weeks unless someone files a lawsuit to stop the slander and defamation of character that appears to be part of Beck’s conspiracy theory. The Review will stay on this claim as it continues. Beck ended this episode with a preview of the next day’s show, and a plea to his viewers to tell others to watch it. He also promoted some August 28th event in Washington, Restoring Honor. Beck excels at self promotion. Self promotion seems to be his first priority. The Glenn Beck Review is located on the Internet at sharethisurlaboutglennbeck.com/ for a reason. It’s an attempt to get The Glenn Beck Review out to “everyone.” Obviously there are many in his audience who do not own a computer, so a book is in the works. Meanwhile, millions of people, both progressive and regressive, do not really understand what Glenn Beck is really about; but they are beginning to. You can help.